An Account of an Embassy to the Kingdom of Ava, sent by the Governor-General of India, in the year 1795 - Michael Symes 1800 - W. Bulmer and Co., London - First Edition, Large Paper Copy	A stunning and rare large paper copy of ‘the first full account of Burma to be published’, finely illustrated with two folding engraved maps, eighteen engraved plates, and eight engraved botanical plates (four of which are folding). In contemporary full polished calf armourial binding of Sir Richard Colt Hoare, 2nd Baronet, and once housed in the Hoare Library at Stourhead. His detailed account, is highly interesting with keen observations and insight. ‘It is a mass of information on the history, religion, government, social systems, language, geography and economy of Burma, together with a narrative of Symes’ seven months stay in Burma, his journey to the capital and reception at court.’	With chapters on the history, topography, architecture, etc. ‘Symes was accompanied by Dr. Francis Buchanan and his Account contains eight fine folding botanical plates and descriptions of ‘the most rare and curious’ plants he collected. Other illustrations are taken from drawings by the Indian artist Singey Bey who accompanied the mission and whose accurate representational style attracted some attention at the Burmese court.’. This expedition marks the beginning of the modern exploration of Burma. Also included is a description of the Andaman Islands. Provenance: Sir Richard Colt Hoare, 2nd Baronet, of Barn Elms (1758 -1838) in armourial binding with the gilt bocked crest of an eagle’s head erased charged with an ermine spot, and initials CH. From the Hoare Library at Stourhead (see John Bowyer Nichols, Sir Richard Colt Hoare, Catalogue of the Hoare library at Stourhead, Co. Wilts (1840) page 588). Richard Colt Hoare, antiquarian, archaeologist, artist, and traveller, was the only son of Sir Richard Hoare, 1st Baronet, of Barn Elms in Surrey, and Stourhead in Wiltshire. He worked for a time in the family bank, but left it, when entrusted by his maternal grandfather, Henry Hoare, with the management of the Stourhead property. In 1787 he succeeded his father in the Baronetcy. Sir Richard travelled widely on the Continent, and wrote a number of books on antiquities and travel, including a History of ancient and modern Wiltshire. He left a collection of books on the history of Italy to the British Museum. He was made a Fellow of the Royal Society, of the Society of Antiquaries and of the Linnean Society. The library (Stourhead heirlooms) of Sir Richard Colt Hoare was sold in London by Sotheby, Wilkinson & Hodge 30 July 1883, a remaining portion being sold 9 December 1887. References: Herbert, Burma 179. Cordier, Bibliotheca Indosinica 445. Cox, Literature of Travel, V1 309. Löwendahl, China Illustrata Nova, Supplement 74. Quarto (34.5 x 27.5 cm. Page size 33.1 x 26 cm). pp. xxiii [1 (errata)] 503 [1 (directions to the binder)] . Bound without half-title. 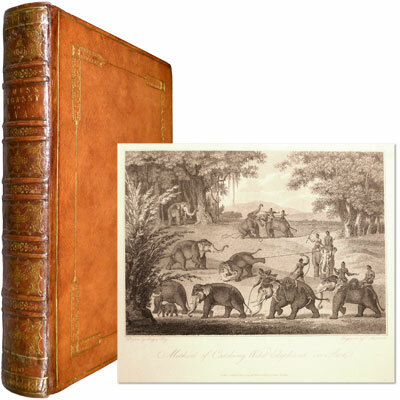 Pages watermarked 1799 or LEPARD 1794. Maps - 1 folding map Sketch of Birman Empire, 125 folding map of the Irrawaddy. Plates - 186, 187, 210, 248, 298, 308, 310, 312, 316, 318, 340 (Birman Alphabet), 346, 348, 388, 414, 424, 428, 446. Botanical plates - 473*, 474*, 475, 476*, 477, 478*, 479, 480. *folding plates.